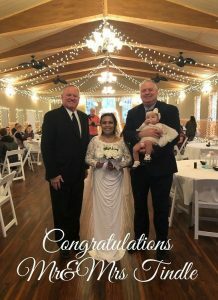 What a beautiful wedding in East Tennessee for Sam and Caren Tindle at the sweet location of Gardens of Sunshine Hollow, who provided the location the meal and the cake made right there on the premises by owner, Fred, and wife, Vicky. Capturing the moments for memory were Brandon Johnson of Striking Art Photography. Providing sound and fun at the reception is Terry of Mckee Promotions Entertainment.